3 Easy Ways to manage your health & SAVE! 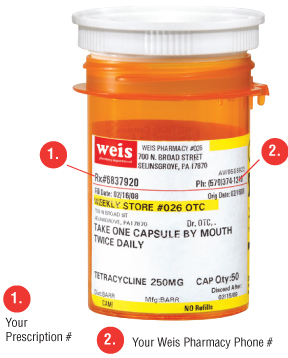 For your convenience Weis Pharmacies now offers 3 easy ways to manage your prescriptions; online, by phone or with our free AutoFill service. Press "1" to place a refill order. The Rx number will be repeated back to you, press "1" if correct...otherwise press "3". To refill another prescription press "1", if finished press "3". If you would like to speak to a member of your Weis Pharmacy team during regular business hours, just press "0" after the automated attendant answers. 3. AutoFill: When you sign up for AutoFill, your Weis Pharmacy will make managing your prescription refills easier than ever...and it’s FREE! We’ll call you automatically when your prescription is ready to be picked up. Speak to a pharmacist today to enroll. TO ORDER FROM A NON-TOUCH-TONE (ROTARY) PHONE: Call your Weis Pharmacy during regular business hours and wait a moment after the automated attendant greets you. Then simply remain on the line and one of our courteous pharmacy associates will assist you. * Listed on your prescription label are the number of refills authorized by your doctor. If your order goes beyond this limit, we'll call your doctor and, if authorized, refill your prescription. However, this may delay the completion of your order.